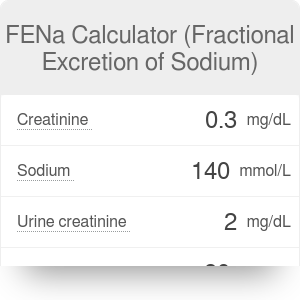 This FENa calculator (fractional excretion of sodium calculator) can be useful in the evaluation of acute kidney failure and low urine output. You can use this tool to determine the cause of kidney failure - whether it is due to pre-renal, post-renal or intrinsic renal pathology. This article will present you with all the information you need to know - what lab tests results you need, what is the formula used by our calculator and how to interpret the outcome. FENa is the percentage of the sodium filtered by the kidney which is excreted in the urine. This value is widely used to help differentiate pre-renal disease (decreased renal perfusion) from acute tubular necrosis (ATN) as the cause of acute kidney injury (AKI). FENa cannot be used in patients on diuretics. Creatinine: first of all, you need to know your creatinine level in mg/dL. This is an indicator of kidney malfunction that is also used by our MELD calculator. Normal levels of creatinine in blood are approximately 0.6 to 1.2 mg/dL in adult males and 0.5 to 1.1 mg/dL in adult females. Sodium: the serum sodium test, also referred to as Na+ test, tells you the level of sodium in your blood. Urine creatinine: your doctor may use a random urine sample or a urine 24-hour volume test to test for creatinine. As the name suggests, this creatinine urine test measures the amount of urine produced in a day. Urine sodium: This is the amount of sodium in all urine collected during 24 hours. The reference range for urine sodium is 40-220 mmol/L per 24 hours. UNa stands for urine sodium. You can find the same number using a different method - multiplying the plasma sodium concentration by the glomerular filtration rate. Prerenal acute kidney diseases are those that decrease effective blood flow to the kidney and cause a decrease in the GFR (glomerular filtration rate). They include hypovolemia, CHF, Renal Artery Stenosis, Sepsis, etc. Intrinsic AKI refers to disease processes which directly damage the kidney itself. These include ATN, AIN, Glomerulonephritides and other. Postrenal acute kidney diseases most often occur as a consequence of urinary tract obstruction - conditions such as BPH, bladder stone or bilateral ureter obstruction. FENa Calculator (Fractional Excretion of Sodium) can be embedded on your website to enrich the content you wrote and make it easier for your visitors to understand your message.